I love classic stories and rhymes turned into story books. This is no exception. Kate Toms takes the Itsy Bitsy Spider and tells the classic rhyme on the first page almost word for word how I remember it from my childhood. No big deviations from the story. The rest of this sturdy board book tells what happened next. 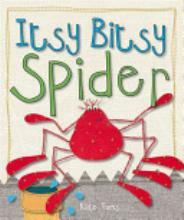 The itsy bitsy spider goes on an impromptu adventure and runs into some tame danger that is intended to bring some minor suspense to the story, but nothing to scare your child. This book is great for teaching rhyming and sequencing. My daughter loves to sit with me or my husband and have us read her this book and supply the words to the rhymes when we pause. The illustrations in the book are also very cute, keeping the spider looking very cartoonish for those of us who dislike bugs greatly. The pictures on each page look as though they have been made out of fabric sewn together, however, they were most likely digitally created. The only problem that I have with this book is truly my problem. I can't keep the rhythm up on all of the pages, and struggle through the rest of the book once I've "lost" it! My husband is better at keeping the rhythm and getting it back after losing it. This book definitely gets a thumbs up and will stay in the book collection for a long time.